Word for Today: You did NOT choose Him; He chose you! Word for Today:You did NOT choose Him; He chose you! Hallelujah! Hallelujah!! Hallelujah!!! Praise God for grace! “No man can come to me, except the Father which hath sent me draw him: and I will raise him up at the last day” (John 6:44). Everyone of us needs the GRACE of God to be drawn to Christ. Please, thank God for grace. Some preachers sometimes wonder why a particular person is so difficult to covert. Not only the preaching is needed; grace is required to draw a soul to Christ. 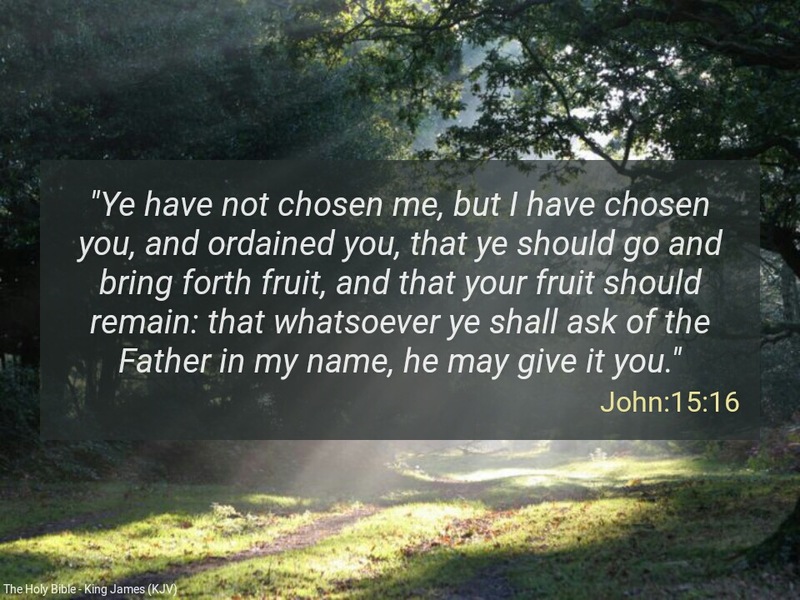 In Christ Jesus, God has chosen us to go into the world and bear fruit ( fruit here is not limited to having children), rather refers mainly to spiritual fruit. Yes, we are to go into the world and bear fruit. We are to win souls by sharing the word and ministering Him to others; we are to ensure that the souls that we have won are growing and maturing. The memory verse is not without a promise: “that whatsoever ye shall ask the Father in my name, he may give it to you” (John 15:16c). Father, thank you for drawing us to Christ; as we share your words daily, please help us to draw uncountable souls to Christ in Jesus mighty name. Amen. Previous Previous post: Word for Today: Ignorance is a serious darkness.